University of California Press, 9780520246881, 574pp. The Copyeditor's Handbook is a lively, practical manual for newcomers to publishing and for experienced editors who want to fine-tune their skills or broaden their understanding of the craft. 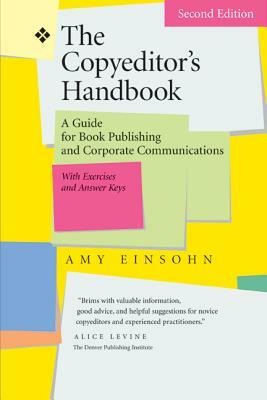 Addressed to copyeditors in book publishing and corporate communications, this thoughtful handbook explains what copyeditors do, what they look for when they edit a manuscript, and how they develop the editorial judgment needed to make sound decisions. This revised edition reflects the most recent editions of The Chicago Manual of Style (15th ed. ), the Publication Manual of the American Psychological Association (5th ed. ), and Merriam-Webster's Collegiate Dictionary (11th ed.). Amy Einsohn is a professional editor with twenty-five years of experience in scholarly, trade nonfiction, and corporate publishing. She has taught copyediting classes through the University of California's Extension Program and through Editcetera (a San Francisco Bay Area editorial cooperative) and has also conducted on-site corporate training workshops.